Change the Key-Binding by pressing the desired keys. So to change Copy from the default Ctrl-C to Ctrl-Comma, press both the Ctrl key and the ',' key. In theory it's possible to choose almost any key combination, however foolish. Each key can be used alone (e.g. F1 for Help) or in combination with any or all of the Ctrl, Shift and Alt keys. However some combinations won't work as they will have been pre-empted by your window-manager (e.g. Ctrl-Alt-Delete). Entering a different key combination. Clicking the Default button to return to the default (if there was one). Clicking the Clear button to remove any binding for this command. Change the Label. If the command in question can be accessed from a menu, you might wish to change the label that appears there. If so, your first step should be to lie down until the feeling goes away. If it doesn't, you can replace the label with one of your choice by clicking the Change Label button and following the instructions. Change the Help String. Again this applies only to commands that have menu entries. As you won't have noticed, some of these entries, when highlit by the cursor hovering over them, produce a helpfully descriptive message on the left of the status bar. If you wish to amend or remove such a message or add your own, click the Change Help String button and follow the instructions. 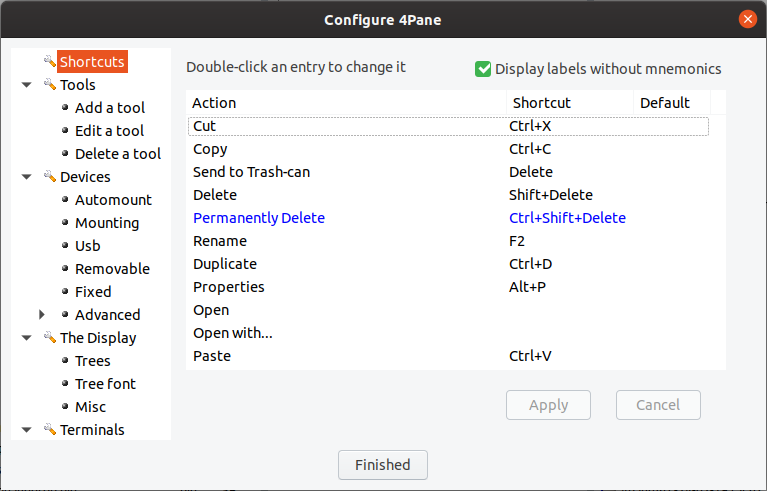 If you're using gtk2 the Configure Shortcuts page of the Configuration dialog has an extra tick-box at the bottom. This turns on and off gtk2's hijack of the F10 key, which it uses to open the File menu. I prefer to use F10 as the Create a new file or directory shortcut, but if you want it to open a menu, this is where you can tell it to. You'll have to restart 4Pane for it to take effect, and you'll need a different "Create File" shortcut.